Race to Sedan, France – After 42 punishing, deadly days of fighting American troops finally gained the upper hand against the Germans in early November 1918 in the Battle of the Meuse-Argonne. There, more than 1.2 million U.S. troops fought the largest American battle ever. It was bigger than the World War II Battle of the Bulge (500,000 U.S. soldiers), or the WWII Normandy Invasion in which 156,000 Americans participated. U.S. troops fighting in the WWI Battle of the Meuse-Argonne in France. Photo: Library of Congress. By the Meuse-Argonne battle’s end, 26,277 Americans were killed and 95,786 wounded. The final American objective of World War I was the rugged region around French town of Sedan. It was a final furious U.S. push to cut off the entire German 2nd Army and sever the enemy railroads that supplied and transported German troops. Sedan was also an important objective for the French. It had been the site of a major French defeat by the Germans during the Franco Prussian War. For those reasons, Sedan was targeted for recapture by the Fourth French Army. 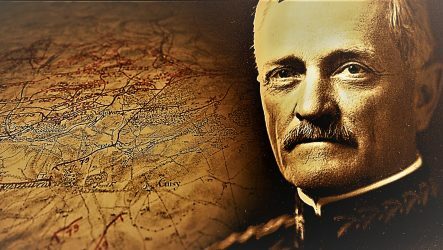 American Expeditionary Forces commander, General John J. Pershing wrote about Sedan in his diary on November the 5th and his desire to see General Theodore Dickman’s U.S. Army’s I Corps be the first U.S. troops to free Sedan. After almost a month-and-a-half of fighting, U.S. troops had finally forced the Germans from the trenches. The doughboys were now chasing them into a hasty retreat back toward the Meuse River and into Germany. On November 6, General Pershing’s diary showed his desire for U.S. troops to beat French troops to Sedan. He suggested French General Paul Maistre, whose troops were fighting on the right flank of the American troops, would approve. General Dickman would have other Allied competition in the glory race to free Sedan of its 4-year German occupation. 1st Division commander General Charles Summerall also ordered his troops to be the first to recapture Sedan. Soon they crossed into the advance line of Dickman’s I Corps troops. In the ensuing chaos, the U.S. troops opened fire on each other. A furious General Dickman called for General Summerall to be court-martialed. Cooler heads ultimately prevailed. The May 1922 edition of the Saturday Evening Post finishes this post.